A fall bounty of hawthorn berries brings the low lying areas of Grand Teton National Park to life. Bears are the crowd favorite, as one can imagine. They clumsily climb among the small branches, which can barely support their weight. A bear though, can pack on many pounds in the fall when a food source like this is abundant. Upon closer inspection you can see many other animals feeding on these little morsels. Birds, like the Robin and the Waxwing, for example. Here, a Cedar Waxwing perches on a branch after being handed a berry from another member of the flock. 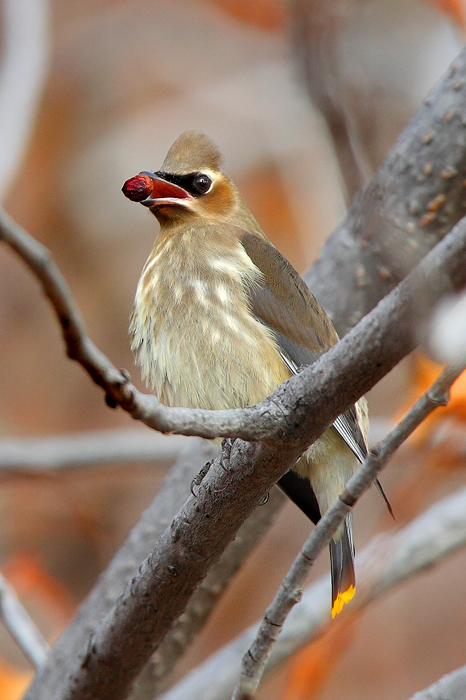 Berries play a large role in the life of a Cedar Waxwing. It is not uncommon to see a group of them lined up on a branch passing berries down the line so that they all can eat. Waxwing pairs will also pass items such as berries back and forth between each other as an act of courtship.